Design, functionality and the ideal weight - our fittings and hand showers are real eye-catchers and work perfectly. We use different materials which need a bit of care from time to time. The end does not always justify the means - so rely on the best cleaning agents available which are recommended for that specific application. Mixtures can be dangerous. We recommend not mixing different cleaning agents together in one container. The substances might react chemically. Careful with chemical cleaning agents: we recommend avoiding the use of cleaning agents with hydrochloric acid, formic acid, acetic acid, chlorine bleach or phosphoric acid. They will damage your equipment. We recommend cleaning without friction and not relying on abrasive products, such as scrubbing cleansers, pad sponges and microfiber wipes. In order to prevent calcification, we recommend thoroughly cleaning once a year. Lost the shine or persistent calcification? The dosage and exposure time of cleaning agents depend on the degree of staining. But the agent should never be used longer than required. Rely on the middle-man: Apply the cleaning agent always on a cloth or sponge and then apply it to the fittings or shower. This way, no liquids can drip into openings or gaps. After cleaning? Bring on the water! Thoroughly cleanse your elements with water at the end. And everything will shine like new. Liquid soap, shampoo and shower gel are part of anyone's travel kit. However, their remains may cause long-term damage to surfaces. Same rule applies: Cleanse with plenty of water and nothing will happen. Cleaning agents for your caravan in one set. 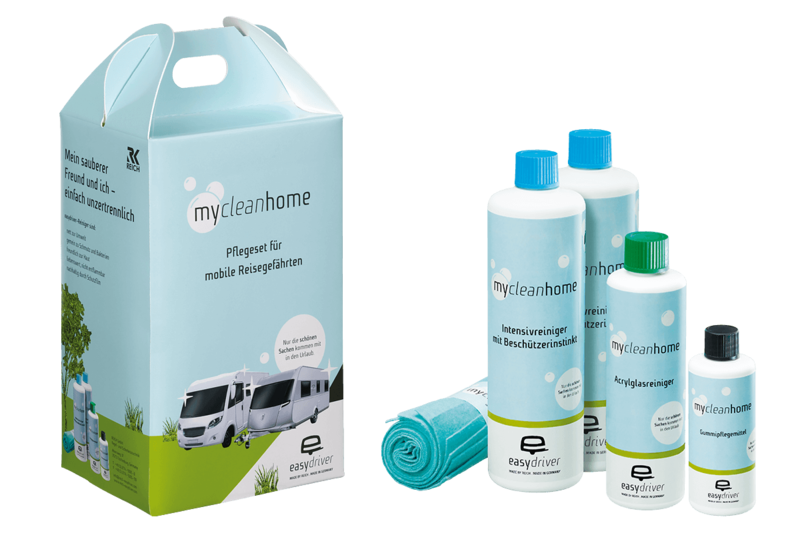 The mycleanhome care set of our brand easydriver includes everything you need to feel comfortable and clean in your motorhome. The rubber care product takes care of dry seals on windows and doors, leaving them with increased elasticity and moisture-repellent. The acrylic glass cleaner provides a shiny perspective. Persistent dirt is taken care of by the intensive cleaner for white plastic surfaces, such as doors and shutters as well as PVC surfaces. Including fresh scent, surface sealing and sun protection.